TPC Overall Rank: #184 out of 2933 rides. This was a big reason why I wanted to go to Kennywood. And again, this is the last of its kind in the country. That was a big selling point for me. As a dark ride lover, this walk through was on my "cant miss" list. It didnt let me down at all! First of all, how bizarre? Noahs ark? Of all the things in the world...and I loved how it rocked the whole time. That was intense. A few of the elements found inside made me wonder if the park had ever been threatened with a lawsuit, but everything was fun. I like the risks taken, personally, but its not like I got hurt on there! I liked Noahs little song too. "Noah is my name!" My sister was like "In all the time that he was on the ark, couldnt he have thought of a better song than that?" Thank goodness Im not quite as critical as she is. Great ride. Sweet and unique. I think my walk through was negativily effected by this group of teen agers who wouldnt shut up, and kept making fun of everything. Honestly, I just wanted out and away from them I coudldnt take everything in. 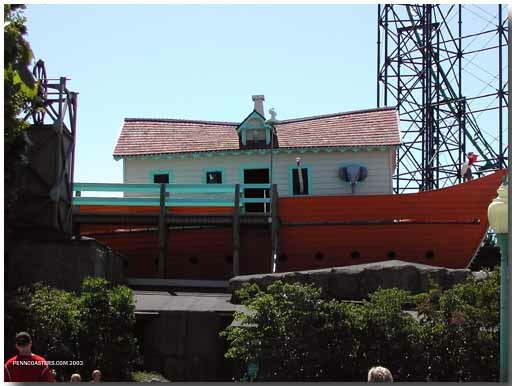 I miss the whales mouth... my gram tried to get me to go in when i was like 4 or 5 and i got halfway in the whales mouth and ran out screaming and crying... haha... i dont really like the new version too much, not very "noah-like"
I cant believe I didnt review this earlier. I didnt know what to expect. The queue wrapping around the ark is neat and the effects inside are unique. The only minus in my mind is the hokiness/fakeness of many of the animals and renditions of Noahs family. I love the rocking motion throughout the ride and the surprise ending. EDIT: Sept 2004 - I forgot the anticipation building on the elevator ride and the moving walkways which tend not to appear in funhouses anymore. I wished i liked it better but it just didnt grab me. maybe im not a walkthru fan i dont knoiw. i found parts of it to be creepy in the bad way and was more than happy to get off. even after saying that i would still ride it again and like the history of it. This was a very fun ride/walkthrough. It wouldve been more fun if there had been more inside and the animals moved. I think a gorilla may have rocked a little bit..... The rocking of the ship and the moving floorboards was really fun, especially watching the fraidy cats and clumsies try to navigate them or the stairs while the boat is rocking. They shouldve kept more rides like this around! A very nice fun house with some pretty cool effects. The end can get you a little bit wet, so its a nice way to coold down after a long day in the park. I love all the special effects, like rocking floorboards. Not to be missed at Kennywood! A truly nostalgic ride, Noahs Ark is my favorite walk through fun house. The new effects are pretty cool, although I must admit I liked the old entrance through a whales mouth! Nothing overly scary here, just a lot of spooky, fun effects. The shaker boards are really neat, and so is the wide array of animals you see. Great ride for a change of pace.